We here at Nacho Patrol call a lot of bars home–but when it comes to Monday afternoon drinking/writing adventures, there are few other places to which we will turn other than the Lower Depths. Located, as is the theme lately, in the Fenway Neighborhood, the Lower Depths is a trendy little bar with an interesting menu ($2 deep fried hot dogs!) and over 120 different kinds of beer (including 3 40oz brands! Long Live Mickey’s! And Tusker! Thank god!) 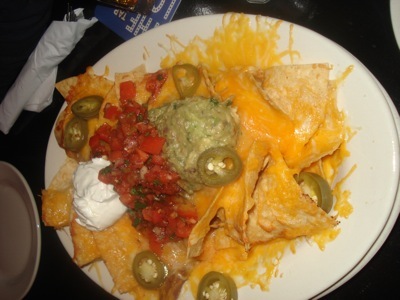 Yes, we’ve spent a chunk of time there over the years…but until yesterday, we had not enjoyed the nachos. Unfortunately, our wallet wishes we would have kept it that way. Overall: 27/40. Delicious while they lasted, but not nearly enough. Lower Depths, you have failed us! It was the first time, and please let it be the last!